I have installed many overflow systems on water storage tanks. While learning the best process, I have also learnt what not to do. Watch my easy-to-follow 6-step guide on how to add an overflow system to your rainwater tank. With the right tools on hand and the correct method, this task is very simple. There are two popular sizes of overflow fittings. 3" and 4". The first thing you should look at when trying to decide what size you need is the size of your roof. The reason for this is; the larger the collection area, the more water flowing into the tank. When the tank is full, this equates to more water that needs to exit the tank. Example: If you're putting a 2,600 gallon water tank under a 1,000 square feet roof, a 3" overflow system would be fine. If you have a 3,000 square feet roof area flowing into any size tank, you will want to install a 4" overflow system. Although there are several designs of overflow systems available, each design will work very similar. In this example, we are using a system from Rain Harvest. Add rubber gasket to fitting - Adding this gasket to the back side of the flange will stop water leaking out the fitting joint when the water level is high. Drill hole in tank - Using a hole saw that is 3/4" larger than the fitting size, drill a hole in your desired spot. Always on a flat surface! Clean hole - It is important to break away the small hairs of plastic on the surface of the tank. If these are not removed, when the gasket is added, water may leak out past the fitting. Insert overflow fitting - Place the fitting in the hole with the inside curve facing upwards. To get this straight, make sure that there is a screw hole at the top and bottom. Screw overflow fitting to tank - When adding the screws, maintain pressure. Stop the screw when the gasket starts to bulge. Add overflow pipe or screen - Now it's time to add the screen insert or plumb the pipe if you are wanting to channel the overflow water away from the tank. Watch the video below to learn more. 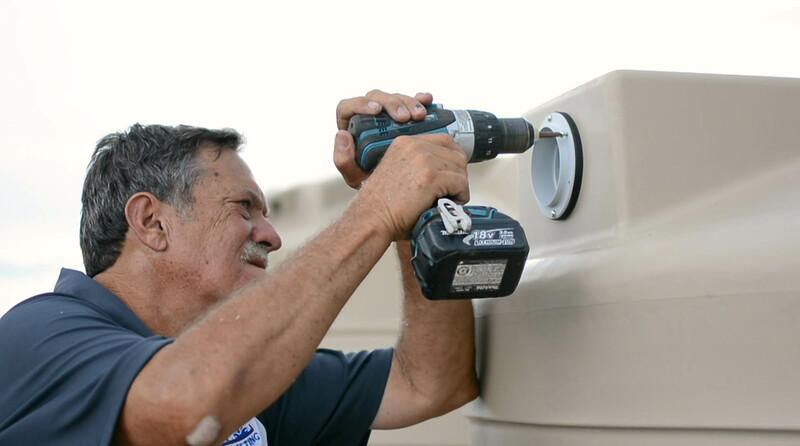 As you've seen, installing an overflow system to your rain harvesting tank is very simple. If you have any questions or comments on this process, please add them below. I would be happy to help out where I can.